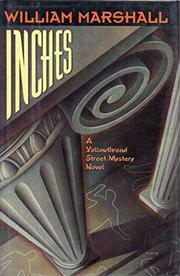  The first of Marshall's antic Yellowthread Street novels since Out of Nowhere (1988) hits the ground running when the rapid- response team that breaks into the Hong Kong Bay office of the Asia-America Hong Kong Bank finds all nine employees dead, poisoned by cyanide without a mark of struggle or protest. Whodunit, and how? Inspector Harry Feiffer focuses on two suspects--gambling toxicologist Dr. Edward Tolliver and shopping-mall security chief George Shoemaker--but before the case lurches into the first of its manic twists, there are the even more farcical interludes of Inspector Christopher Kwan O'Yee, disguised as a lunatic street person for reasons he himself can't imagine, and Inspectors Bill Spencer and Phil Auden, summoned to the Institute of Wu to figure out why patients of the Wu brand of therapeutic psychodrama keep throwing themselves out the 18th-floor window--or, if they can't figure it out, to catch them in mid-leap. Nobody rivals Marshall's ability to expose the links between comic hysteria and the most mundane human foibles, from greed to cowardice to simple funk. It's great to see him still crazy after all these years.